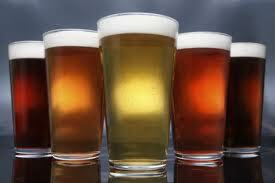 'Italian Beer' by Guest Writer Ben McFarland - "British Beer Writer of the Year" ~ Sardinia Baby! 'Italian Beer' by Guest Writer Ben McFarland - "British Beer Writer of the Year"
Asking whether Italy is home to an exciting beer scene is like asking whether the Pope is a little bit partial to amusing millinery. Of all the up-and-coming brewing nations in the world, Italy is the one to watch. In fact, it’s pretty much upped and come already. Having lived for so long in the brewing shadow of its more northerly neighbours, Italy now finds itself at the diamond-cutting edge of new wave brewing. It may have arrived late to the craft beer party but it’s arrived fashionably late, bikini-clad babe on each arm, before coolly tossing a set of Ferrari keys in the bowl. Until the appreciation of all things epicurean got the better of it, Italy had remained relatively immune to the micro-brewing bug but a craft brewing craze that started in the early 1990s, with a few home-brewers opening brewpubs, has now mushroomed into a pioneering movement that’s young, energetic and aiming squarely at the top end of the market – well away from the euro-fizz peddled by Italy’s big brewers. Working in close association with Italy’s “Slow Food” movement, Italy’s craft brewers often work in collaboration with local boutique artisan producers and tend to source as many indigenous – and eclectic - ingredients as possible. The movement, which consists of more than 150 microbreweries and brewpubs, was strengthened in 1998 with the creation of Unionbirrai, a craft brewing union designed to raise awareness of the fact that Italy is now home to some insanely inventive, unpasteurised ales. In the last ten years, the likes of Teo Musso at Le Baladin and Agostino Arioli at Birrifico Italiano have taken the common perception of Italian beer, as merely an accompaniment to pizza, and sliced into pieces. Other pioneers include Lambrate, Panil and Birra Del Borgo although the list could go on and on.